Our philosophy! Throughout our chain of command everyone understands that responsive service is the key to our success. Our guarantee! We stand behind our sale. Repeat business is more important than first sale. USE: Primarily used indoors in warehouse type operations. They are not well suited for outdoor use unless the surface is solid and relatively smooth with no curbs or changes in driving surface heights. 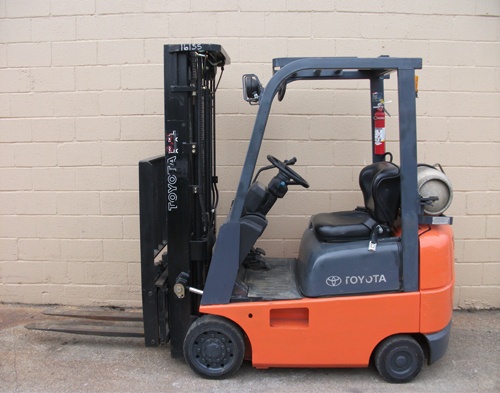 They are smaller in size and less expensive to a Pneumatic Tire forklift of equal capacity. FUEL: Primarily LP Gas – Gasoline, Diesel & sometimes Compressed Natural gas. USE: The Pneumatic Tire forklift it offers greater versatility (than the Cushion Tire forklift) on outdoor driving surfaces due to its higher ground clearance and larger tires. The Pneumatic Tire forklift is slightly larger in size when compared to a Cushion Tire forklift of equal capacity. Commonly referred to as a “Yard Truck”. USE: Primarily used outdoors where terrain may be rough. Better ground clearance than Pneumatic Tire forklift. Can be used in mud, gravel or areas with severe ruts. Units available in 2wd & 4wd. USE: Primarily used indoors on smooth surfaces. Ground clearance same as cushion tire forklift. Good in areas where fumes may be harmful such as food operations and areas with little or no ventilation. Charger required as with all electric power units. USE: Similar use to a 4 wheel sitdown rider. The advantage is a tighter turning radius. USE: Used indoors on smooth surfaces. Primarily operates in very narrow aisles storing & retrieving pallets. Reach mechanism extends to reach into the rack. Outriggers are required to counter load weight. USE: Better suited for stacking short moves. Works well on docks for fast truck loading. Rider faces forward rather than side mount. USE: An order picker is a type of lift truck that features an elevating platform that allows the operator to be raised into the air, which facilitates less-than-unit-load picking or stocking. USE: Stackers are general utility, electric-powered vehicles suitable for stacking and for short moves such as staging and order accumulating. Unlike the Counter balanced Stacker,the Straddle Stacker counters load weight with outriggers or “legs with wheels”. USE: Unlike the Straddle Stacker the Counterbalanced Stacker contains no “outriggers”. Loads are counterbalanced using the overall length of the unit plus battery weight. USE: Electric Walkies are highly versatile low-lift pallet and/or skid handlers. Tires are hard and fork size is usually 27” wide x 48” long.